The horticulturist Alan Chadwick, according to his disciples, rebuked anyone caught weeding sow thistle (Sonchus) from his garden beds. “They’re all plants,” he once declared. “It’s just that, if a plant is growing where we don’t want it to grow, then we call it a weed.” The difference between a weed and a plant, in other words, boils down to human preference. And our personal preferences aren’t always good ecological choices. Though we might chafe when a Sonchus sprouts in a bed of carnations, how often do we pause to consider the plant’s role before uprooting it? Chadwick removed and composted sow thistle only after the plant matured, since its deep taproot could access soil nutrients that his other plantings could not. It’s this disconnect between our aesthetic sensibilities and a plant’s ecological role that fascinates me. Whether we’re planting for beauty or weeding for uniformity, we impact our local ecosystems. But rather than focusing on “weeds” like the Sonchus in this blog post, I’d like instead to consider what we plant intentionally. As gardeners, shouldn’t we consider both ecological impact and beauty when deciding what to plant? What could possibly be at stake? Let’s take a staple garden ornamental as a test case: the common butterfly bush (Buddleja spp.). You might not be aware of the controversy surrounding this shrub. Like me, you might even rely on Buddleja to draw pollinators to your garden. And for good reason: it’s attractive, hardy, and a prodigious bloomer. And as anyone who’s ever planted one can attest, butterfly bushes attract a wide assortment of nectarivores during their generous blooming season. It’s the same reason why some exotic ornamentals can be touted as pest-resistant in North America: there simply isn’t anything here that’s adapted to eating them yet (see the “Enemy Release Hypothesis“). Not that these relationships can’t develop over time (or even already exist in the case of potentially pre-adapted herbivores). In fact, in the UK, where butterfly bush naturalized much earlier than in the US, some pollinator species (such as the holly blue butterfly and mullein moth) have adapted to using it as a host (Owen and Whiteway, New 89). In North America, at least one butterfly species, the Variable Checkerspot (Euphydryas chalcedona), has been observed successfully rearing larvae on Buddleja (Shapiro and Hertfelder). But these small evolutionary advances don’t necessarily balance the scale in Buddleja’s favor — not when compared to the potency of native plants as hosts for immature insects. 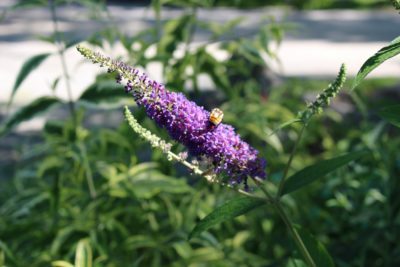 One study found that native plants supported fourteen to fifteen times as many butterfly species when compared to exotic ornamentals like the butterfly bush. “Thus,” the authors of that study conclude, “at least in terms of supporting lepidopteran [butterfly] diversity, introduced ornamentals are very far from the ecological equivalents of native ornamentals” (Tallamy and Shropshire 944). Another potential issue with Buddleja species is the possibility they’ll escape cultivation and naturalize in the wild, where they can crowd out native plants (Tallent-Halsell and Watt). New Zealand, for instance, has resorted to releasing the Buddleja leaf weevil (Cleopus japonicus) as a biological control to check the shrub’s spread. In the United States, at least three states currently list a Buddleja species as invasive. All this is not to say that introduced plants like butterfly bush never fill important ecological niches or positively impact their new habitats. Consider California’s alien flora. In their study of butterflies in the state, two biologists discovered that introduced plants have been largely beneficial to maintaining native butterfly populations. Though at least three species had adopted alien hosts toxic to their larvae, most other butterflies in the region “are now almost completely dependent on exotics… and would disappear were weed control more effective than it currently is” (Graves and Shapiro, 430-31). If non-native plants join the community without reducing the biomass or richness of native plants, the food web supported by that plant community should not be impaired. If, however, the addition of nonnative plants to the community reduces the biomass of native plant species, as has been shown in invasions by Norway maple, bush honeysuckle, Phragmites, kudzu, cheatgrass and others… our results indicate that the production of insect biomass will be compromised. Therefore, adding nonnative plants to native plant communities might increase net plant richness at a given locality, but does not result in additive effects on lepidopteran [butterfly] diversity or abundance” (Burghardt et al, 12). Although none of us can (or should) completely avoid gardening with non-natives, and though it’s the rare introduced species that does become invasive, we can nevertheless strive to incorporate as many native host plants as we can in our yards, gardens, and common spaces. 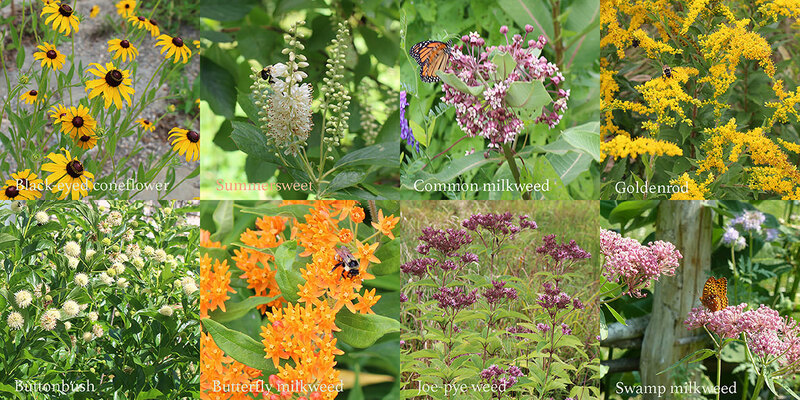 As alternatives to the butterfly bush in Maine, consider summersweet (Clethra alnifolia), black-eyed coneflower (Rudbecika hirta), Joe-Pye weed (Eutrochium dubium), buttonbush (Cephalanthus occidentalis), goldenrods (Solidago sempervirens), and of course native milkweeds. Curtis Jirsa is a former English professor who now tends a small garden and studies herbalism in midcoast Maine. Burghardt, Karin T., Douglas W. Tallamy, Christopher Phillips, and Kimberley J. Shropshire. “Non-native plants reduce abundance, richness, and host specialization in lepidopteran communities.” Ecosphere 1.5 (2010): 1-22. Graves, Sherri D. and Arthur M. Shapiro. “Exotics as host plants of the California butterfly fauna.” Biological Conservation 110 (2003): 413-33. Owen, D. F. and W. R. Whiteway. “Buddleia davidii in Britain: History and Development of an Associated Fauna.” Biological Conservation 17 (1980): 149-55. Shapiro, Arthur M. and Katie Hertfelder. “Use of Buddleja as Host Plant by Euphydryas chalcedona in the Sierra Nevada foothills, California.” News of the Lepidopterists’ Society 51.1 (2009): 27. Tallamy, Douglas W. Bringing Nature Home: How You Can Sustain Wildlife with Native Plants. Rev. ed. Portland: Timber Press, 2012. Print. “Can alien plants support generalist insect herbivores?” Biological Invasions 12.7 (2010): 2285-92. Tallamy, Douglas W. and Kimberley J. Shrophsire. “Ranking Lepidopteran Use of Native Versus Introduced Plants.” Conservation Biology 23.4 (2009): 941-47. Tallent-Halsell, Nita G. and Michael S. Watt. “The Invasive Buddleja davidii (Butterfly Bush).” Botanical Review 75.3 (2009): 292-325.